As I sped along the coast to Nice from Monte-Carlo for dinner one night, a page out of paradise popped up: Eze. This Medieval town, preserved almost to the stone, juts out on the Corniche Moyenne, a rocky rise with a breathtaking view of the Côte d’Azur, which sprawls at its feet. I pulled over to take a photo. It was a clear night and the moon was full, glinting off of a yacht moored in the distance. 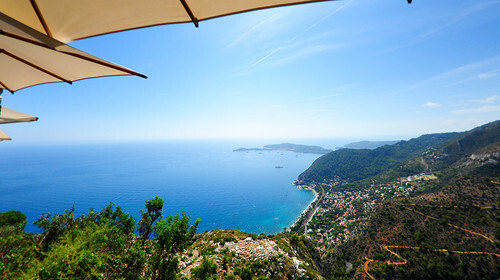 Yes, I knew of Eze, because friends of mine had eaten at Château Eza, one of the two Michelin-starred restaurants inside the village’s walls, a few years before. * And here it was, glowing in the moonlight, begging me for a visit. When I pulled up Château Eza’s website, I saw that the hotel had just welcomed a new chef, Axel Wagner, formerly the executive chef at Georges Blanc in Vonnas, a Relais & Châteaux that has had three Michelin stars since 1981. ** [Editor’s note: readers have notified me that Wagner has been at Château Eza since 2007. See the comments below for more details.] While I’ve never eaten at Georges Blanc, I know of the chef, once scion to a French, culinary dynasty. And I’ve read about his cuisine, which sought to lighten French cooking in the 1970s and 1980s by focusing less on butter and cream and more on the natural flavors of the ingredients. But that’s Georges Blanc’s cuisine. What about Wagner, a German by birth? Now, on his own at Château Eza, what would he cook? Why would he leave a three-starred kitchen to take a post in a one-starred kitchen? Was he wanting an easier life with a fantastic view? Or, was he hoping to build a name of his own? If so, this could be an exciting time to be eating at Château Eza, I thought. I made a morning out of Eze, weaving through its maze of cobblestone streets, thankfully too narrow for cars or buses. Despite its charming looks and breathtaking vistas, Eze is now one, big tourist trap, full of boutiques and restaurants, and a few pricey hotels. Château Eza’s dining room is lined with picture windows. But for lunch, I was seated on the hotel’s wrap-around patio, with a panorama of the Côte d’Azur, dropping away from my table at a dizzying rate. Aux échalotes fondantes et confit de lard fermier. Tartines croustillantes de figue, Gorgonzola et vieux Balsamique. Sur une compotée de pêches, paillettes de romarins. The better the view, the worse the food. That seems to be an inescapable rule of thumb that European restaurants are able to defy more than restaurants elsewhere. Judging by the cars and tour buses lined outside of the city’s walls, not to mention the immense wealth that visits the coast year-round, Château Eza has a fairly steady and captive stream of business. Add to that a magnificent view in a historic setting, and you’ll arrived at a generous margin of error. But, the Michelin star – especially in France – is supposed to be a fairly reliable standard. Well, judging by my lunch at Château Eza, it is not. I was slightly disappointed. Keep in mind, my four-course lunch was only 55€ (around $80), fairly inexpensive for lunch at any restaurant at this level in France, not to mention the Riviera, where prices are slightly inflated. So, I was not expecting luxury ingredients, or excessive frills. I knew what I was getting for the price; it was printed on the menu for all to see. But great meals can be made of humble ingredients. It simply depends on what you do with them. I could overlook the stale toast on which a rather sloppily sliced sausage, topped with pistachios, was served. I could also overlook the mute black truffle that was shaved over an otherwise delicious cocotte of wild mushrooms cooked with lardons. Summer truffles are usually pretty weak, so this wasn’t surprising. The fact that the Parmesan “lollipop,” one of three canapés, was rubbery, wasn’t surprising either, given the humidity on the coast. But it should never have been served that way. And, having to fish out a forest of herbs, flowers, and a bay leaf from a tiny bowl of lobster bisque before I could drink it was slightly annoying. 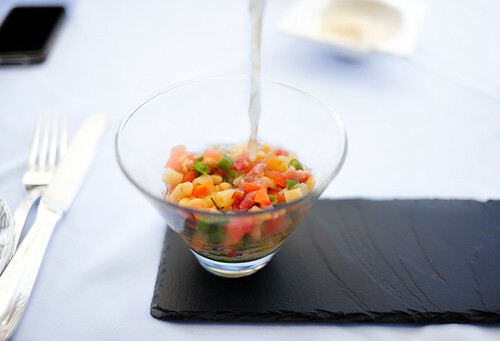 I’ve never understood why chefs finish soups with inedible garnishes. But, overcooked duck I could not overlook. It arrived under a shiny, silver cloche, unveiled ceremoniously. 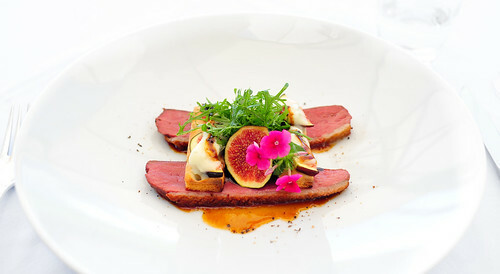 The presentation was gorgeous: two strips of blushing breast meat topped with figs melted onto strips of “tartines croustillantes” with Gorgonzola cheese. All of it was drizzled with aged balsamic vinegar. The duck was so tough I couldn’t cut it. After a couple of bites, one from each piece, I moved on. I ate the figs, which were wonderful, and the “tartine croustillante,” which was more bread-like than crust-like, despite its appearance. But I don’t want you to walk away thinking that this meal was a complete loss. It wasn’t. There was a lovely pasta pistou soup at the beginning, full of nicely diced vegetables and ditalini. The server poured over it a clear bouillon, stirred up the pesto at the bottom, and showered the soup generously with shaved Parmesan cheese. Provençal. Despite the flavorless and odorless truffles, I also loved that cocotte of wild mushrooms infused with the flavor of bacon. That was probably my favorite dish. It was simple, but nicely cooked and flavorful. Dessert was delightful, a cup of peach and rhubarb compote topped with a snowy rise of rosemary granité. I could have done without the quenelle of olive oil sorbet nestled on top; it was much more color than flavor. But, together, this dessert was refreshing and light, a nice end to a summer lunch. Overall, my lunch had a solid frame. If nothing else, it did a lovely job of showcasing the flavors of the south of France. But there were a few too many rough spots, perhaps left uncorrected due to too many tourists blinded by the magnificent view, or honeymoon couples blinded by their love. Or, maybe I just got the B-Team that day. Either way, I found the errors sloppy, and that overcooked duck inexcusable. A Michelin-starred restaurant should really be more precise regardless of its clientele. If Wagner left Vonnas to make a favorable impression on Eze, it didn’t happen at my table. But, for the view, go. You won’t find one better. * Note, the town’s name is Eze. The restaurant’s name is Eza. 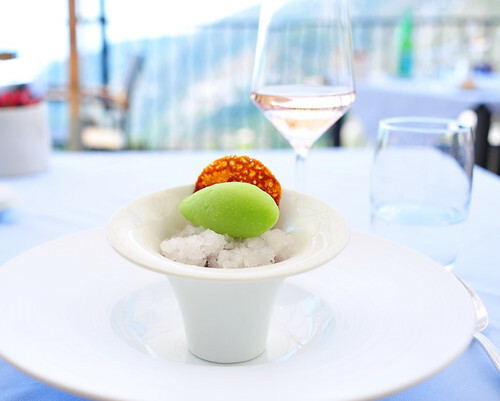 Chevre d’Or, with two stars, is the other Michelin-starred restaurant in Eze. ** The fact that the restaurant has retained three Michelin stars for thirty years is astounding. Surely, Georges Blanc’s status is not being sustained by innovation alone; Blanc’s food is passé by modern culinary standards. So, I imagine consistency must be its calling card. ~ by ulterior epicure on April 20, 2012. Unfortunate, though not too surprising, they’ve had quite a turnover of chefs in the past few years, and seem more intent on catering to tourists and “people” as they’re known in France, and resting on their laurels/stars. Chateau only has 2 stars, though and are lucky to have kept them, Jacques Chibois, lost one of his 2 last year and his food is far superior, no spectacular view though………. If you’re still in the area you should try, “Mirazur”, just got second star and Chef Mauro Colagreco, was just given a Chevalier of Arts and Letters. Thanks for all your reviews and energy. You did well to skip the Chèvre d’Or; you would have been disappointed at three times the price. Too bad you didn’t go to the excellent Hostellerie Jérôme in nearby La Turbie. We live a fifteen minute drive from Eze. Let me know if you will be back in the area. I too have dined at Chateau Eza on several occasions and have enjoyed lovely, inventive and creative cuisine prepared by Chef Axel too. But to my knowledge, he has been the Executive Chef of Chateau Eza since 2007. I also think the view is outstanding, but so too is the food and it the price point is well on target considering the price’s and stuffiness of the other hotel in the village. Is it possible that you have maybe mixed up the history and Chef’s longevity in the house with that of Chateau de la Chevre d’Or? I only mention this because they have had issues with turnover and Chef retention in their kitchen. And I actually think the response made by “jfoureur” is actually accurate but should be aware of which Chef and house he/she is speaking of. 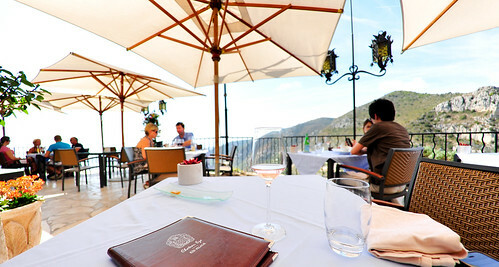 Anyways, I continue to visit Eze when I am in the region and Chateau Eza has yet to disappoint my taste buds. My apologies for confusing the restaurants, chef Alex Wagner has indeed been in place, since 2007. It’s ChevreD’Or with the revolving chef’s door. I should refrain from commenting, till I’m more alert and properly caffeinated and capable of thought. Also I should also have recommended “Hostellerie Jerome”, in La Turbie, also strikingly and consistently brilliant, creative and intuitive food. I say that as it’s true and not just because I live in La Turbie. No view to speak of but great food !!!!!! We stayed in Eze a few years ago. A little lower on the pecking order is Auberge du Cheval Blanc, a family restaurant with good food and a wonderful atmosphere. @dazan and @jfoureur: Thanks for the correction. I see that Château Eza has a new website, on which they’ve updated Wagner’s biography. At the time I was there (September of 2011), the hotel’s website stated that Wagner was newly arrived as chef. I apologize for the mistake. I’ve corrected in the text.